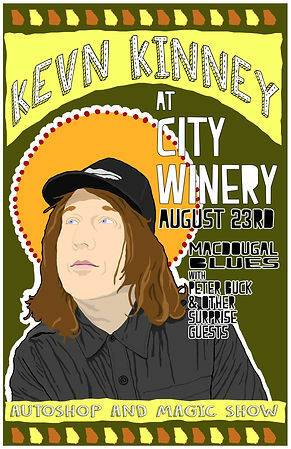 With his August residency winding down just two more editions of Kevn Kinney’s Autoshop & Magic Show are left so time is running out to experience these events. With Drivin’ n’ Cryin’, Edwin McCain, Shawn Mullins, Aaron Lee Tasjan, Great Peacock, Sadler Vaden and more already joining Kinney on stage could it get any better? Well of course it can as Peter Buck (REM) sits in with Kinney and crew this Tuesday night. Kevn Kinney & Peter Buck go way back. A friend and a peer Peter Buck has worked and played with Kinney on multiple occasions. This Tuesday the pair will roll through tunes from Kevn Kinney’s first solo record McDougal Blues. Buck played on and produced the record which contains some of Kinney’s best songwriting. Folk flavored tales about people facing the trials and tribulations of life which is what Kinney does best. Hearing these songs live with Buck playing along is an event to add to your musical bucket list. Another reason to be there is you never know who else may show up to play along with Kevn. I can’t think of anything better to do on a Tuesday night then to enjoy some great music from a great singer/songwriter. Get out of the house and get down to the City Winery, you can thank me later.